There are various laws in place that determine which bird species are classified as pests. These laws detail how, why and when they should be controlled, by whom and also how they should be disposed of. If is absolutely essential that these laws are abided by. Protection of Animals Act 1911 – 1927, Public Health Act 1961, Poisons Act 1972, Health and Safety at Work Act 1974, Wildlife and Countryside Act 1981, Food and Environmental Protection Act 1985, Environmental Protection Act 1990. The General License produced by DEFRA outlines which birds are presently considered pests. The General License allows an authorized person to take damage or destroy the nests of certain listed species. The following are presently listed as pest bird species: Hooded Crow, Collared Dove, Great Black-Backed Gull, Lesser Black-Backed Gull, Herring Gull, Jackdaw, Jay, Magpie, Feral Pigeon, Rook, Wood Pigeon, Canada Goose. A thorough survey will be required to assess how the above birds should be controlled, but this survey is completely free of charge. 1st 4 Pigeon Control London provides unrivalled training, both internally and externally to assure that all work is carried out to the best possible standard. 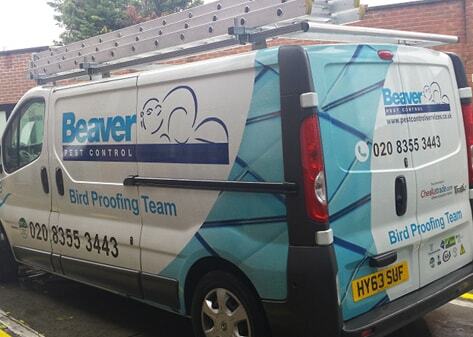 Our company is fully insured audited by the British Pest Control Association and member of BASIS (PROMPT).